Last month saw the return of the P.K.D. Festival to Dalgety Bay in Fife. The festival which started out as a push kart derby is now a charity and has been rebranded as Promoting Kinship Day. It has grown rapidly to become the largest charity music event in Scotland. As well as music it featured a bike and motor show with The Royal British Legion Riders and The Mini Club of Scotland, a funfair, child/family zone, food outlets, a market and for the first time a ”Welcome to Fife Hall”. Included in the music line-up were 911, S.Club, Space and Owen Paul. 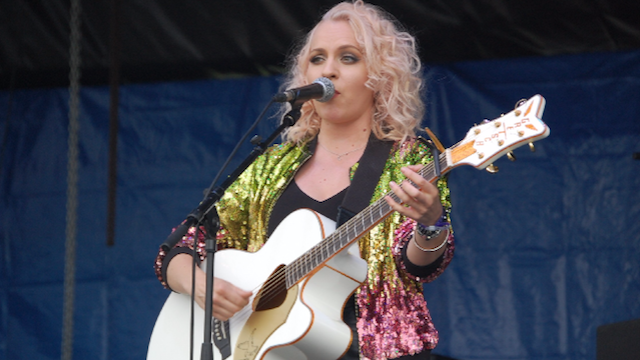 Black Diamond’s “Heart of the Matter” were able to catch up with Philippa Hanna– one of the top British Gospel acts, number 1 in the May 2016 Gospel Album Charts, coming off the back of a major tour with Little Mix. David Aird caught up with Philippa and her husband Joel prior to going on stage. The interview and some of Philippa’s music will feature on BDFM 107.8 on Sunday 21 August at 9 am. Mark Bennett, the organiser, mentioned after the event that artists said that they had never been so well looked after and some festival goers said it was the best one they had attended. The family friendly, incident free event attracted more than 4000 people to Dalgety Bay’s Sports Centre and surrounding grounds.